Our April lecture will be given by Dr Jessica Cooke. 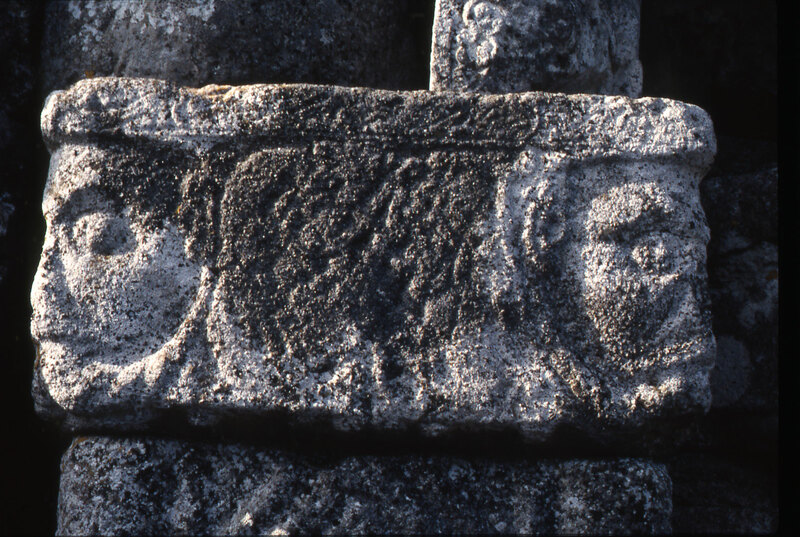 The lecture, entitled The Annaghdown Doorway and King Ruaidhri Ua Conchobair: Loyalty and Patronage in Twelfth-Century Connacht, takes place on Wednesday 18 April at 8pm in the Old Girls’ School (Library), Corrandulla. All are welcome! Stacked in an alcove of the Augustinian Abbey at Annaghdown, County Galway, lie a group of beautiful sculpted heads from a lost mid-12th century doorway. These stones have been a puzzle, pre-dating the Abbey by as much as 40 years. Yet the doorway belongs to a group of exquisite Gaelic-Romanesque portals, including at Killeshin and Glendalough, often built by royal patronage. Though now out of context, it can be shown that the Annaghdown doorway came originally from the west end of a pre-Augustinian Gaelic church, whose west and south walls were later incorporated into the Annaghdown Abbey. History casts further light on how and why the Annaghdown portal was built: the records show that King Ruaidhri Ua Conchobair relied closely on one Domnall Ua Flaithbertaig as his chief Connacht general. It is possible that in the 1160s or ’70s, the Annaghdown doorway was commissioned to reward Domnall’s loyalty, just as Ruaidhri rewarded the rest of his army, according to the annals. That its masons attained the highest level of Gaelic-Romanesque sculpture (more usually seen in Leinster) shows what a rich reward this doorway was, and therefore the growing status of the monastery at Annaghdown. Dr Jessica Cooke holds a first class honours degree from Trinity College Dublin and a PhD from the University of Cambridge. In addition to her scholarly work in the area of medieval history and archaeology, she has also been heavily involved in the restoration of the 14th century Annaghdown Castle.